To all the married couples out there, do you remember your proposal story? Ladies, were you led to the big moment through a carefully placed scavenger hunt, or did you find the ring in a glass of champagne? Guys, can you remember how nervous you were as you popped the question, or all the strings you had to pull to have the Phillies light her name up on the score board? Maybe it was a quiet moment with just the two of you without any extra bells and whistles at all, and you wouldn’t have had it any other way. However we decide to lock in the biggest commitment of our lives, it is, like the wedding day, a whirlwind that comes and goes. The JPG photography team believes that capturing this moment is a crucial piece to your story, and we are thrilled to help tell it. 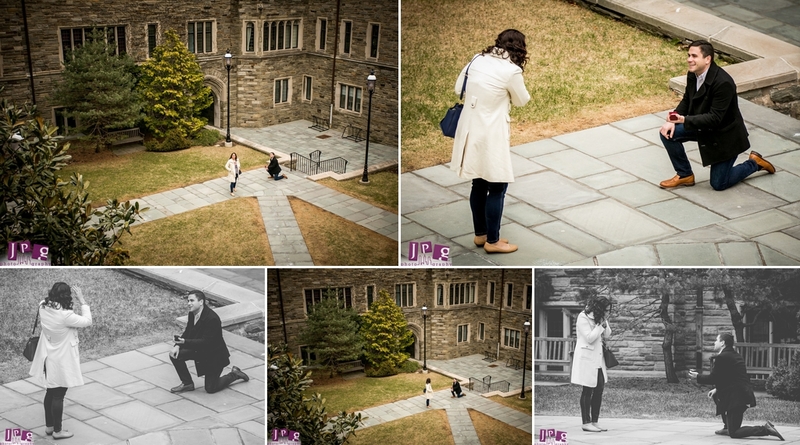 Adrianna and Stephen’s surprise St. Joe’s University proposal is our latest. 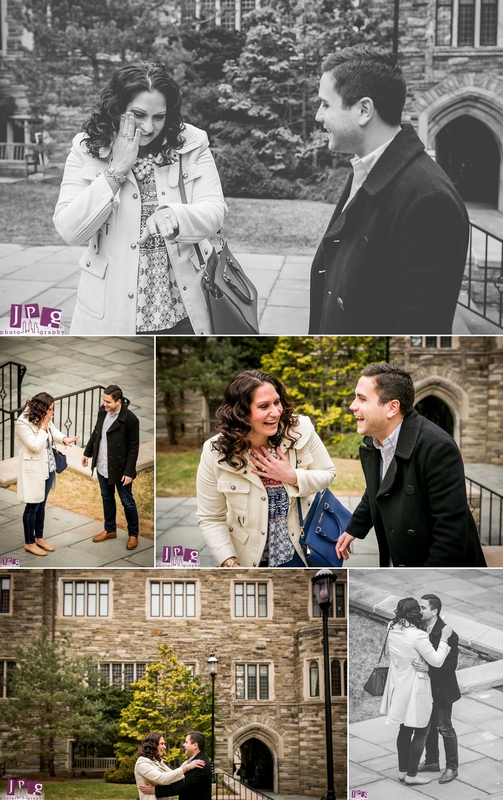 Stephen reached out to us and invited us to document the surprise on Saint Joseph’s University campus square, surrounded by the school they both went to, and where their romance blossomed. 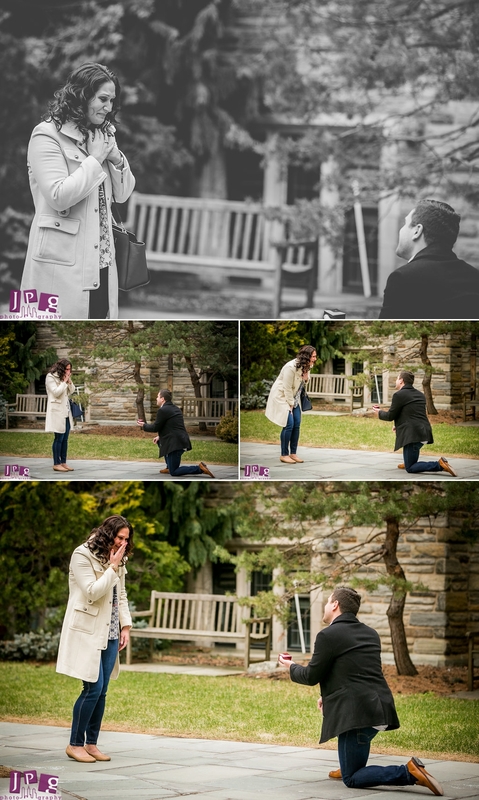 I love shooting proposals. Not only do you have the opportunity to photograph pure and raw emotions, but you also get to be a part of the surprise. You set up, hide, wait, and move in when the time is right. You can’t help but get wrapped up in the excitement and go along with the couple for the ride. In this case, Stephen was walking with Adrianna when he dropped to one knee. Our bride-to-be didn’t notice for a few seconds, and turned around a few paces ahead of him to see her beautiful ring being presented to her. The photos speak for themselves, but Adrianna was overwhelmed with joy. Can you tell what her answer was? 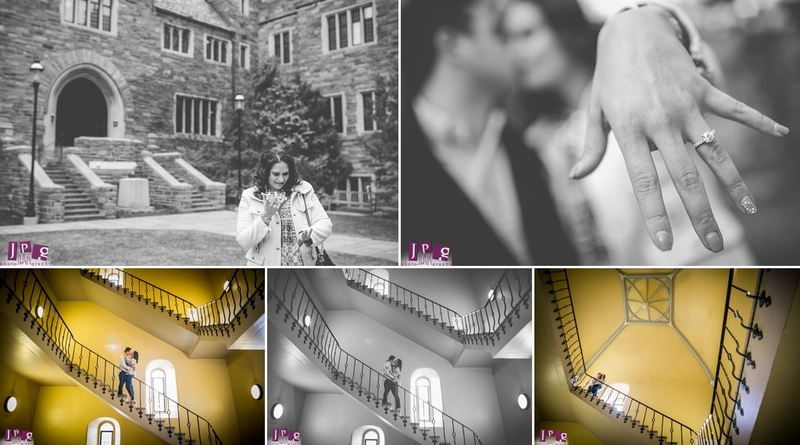 After the ring was officially on Adrianna’s finger, we took the first portraits of the pair as an engaged couple around St. Joe’s beautiful campus. JPG Photography already has a special connection to Adrianna as her sister is also a client. We’re so happy to work with the family again, and continue to tell their stories. 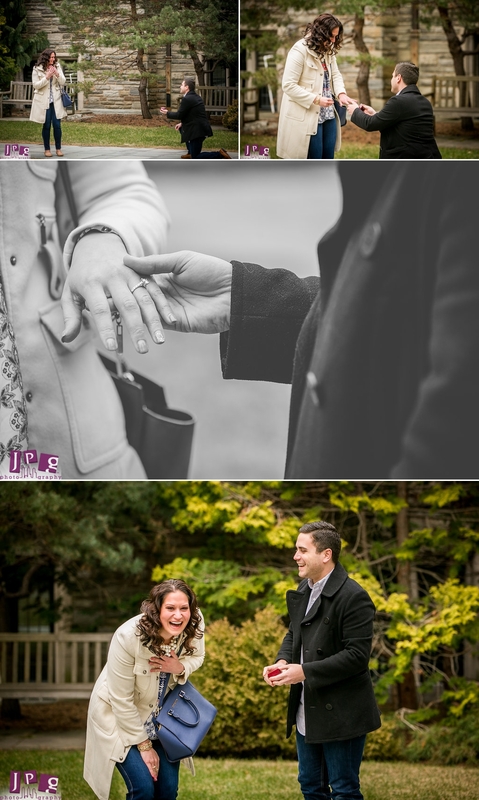 For anyone considering hiring JPG Photography for your proposal, we hope you give us a call. You can trust that we have the experience to expertly capture her saying “yes” without blowing your cover. You will thank yourself when you have the ability to look at the photos years from now, and instantly be able to relive the excitement and happiness of this fleeting event. It is worth it to preserve the memory of one of your most vulnerable, yet most joyous moments.